2018 has been an explosive year for esports in India with prize pools reaching another all-time high. While 2017 witnessed an era of consolidation, 2018 has played host to the start of a growth spurt catalysed in part by international organizations attempting to gain the first mover advantage in a country whose esports ecosystem continues to deliver explosive growth albeit on a low base. However, this growth has not been without its fair share of growing pains including but not limited to cheating scandals, premature announcements and more. Author’s note: This write up represents opinions based off data that AFK Gaming has gathered through publicly available sources, our own database and as received by industry participants. This write up is largely biased towards Dota 2 and Counter Strike: Global Offensive – both titles that AFK Gaming actively creates content and collects data about. The purpose of this article is to provide a detailed view of the Indian esports ecosystem for potential new entrants and existing industry participants alike. This data was not easy to compile and analyse and as such, we ask that you provide due credit to www.afkgaming.com if you choose to use content from here elsewhere. The total announced prize pool in 2018 was INR 5.63 Crore / USD 804 K. Out of the total prize money announced in 2018, INR 3.84 Crore / USD 548K is attributable to tournaments that actually took place in 2018 with the remainder due to be played (and paid) out in 2019. This represents an increase of 172% over last year’s announced prize pool of INR 2.06 Crore. 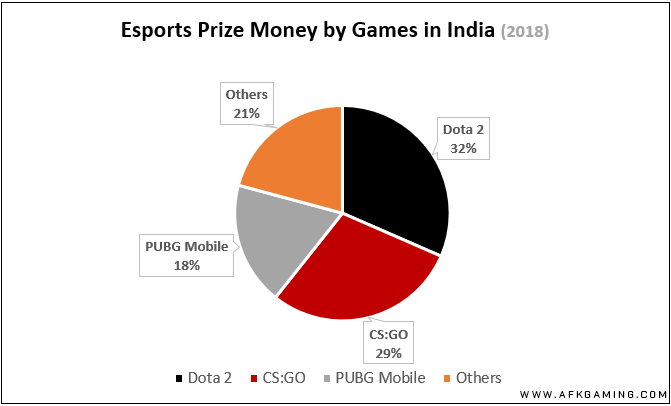 The amount of money to be won from Indian Dota 2 and CS:GO tournaments has nearly doubled year on year boasting prizepools of approximately INR 1.1 Crore / USD 160K per game. 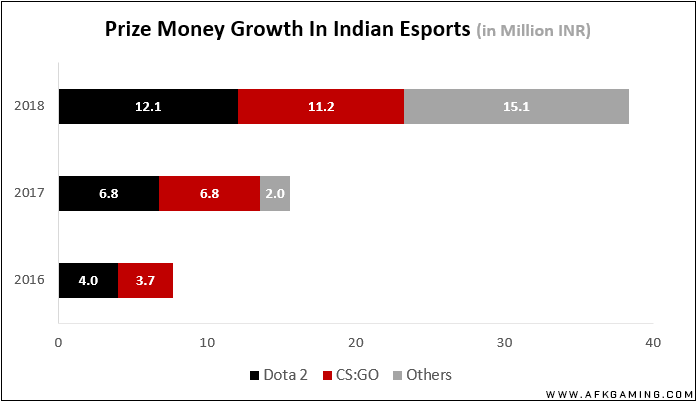 Dota 2 and CS:GO continue to command the lion’s share of prize money paid out in Indian esports. However, PUBG Mobile has officially entered the playing field primarily on account of a INR 50 lakh tournament backed by OPPO and Tencent. This has resulted in the cumulative share of Dota 2 and CS:GO dropping from around 87% of the total in 2017 to 61% in 2018. 21% of 2018’s esports prize money came via titles such as Clash Royale, Overwatch, Street Fighter, FIFA, PUBG PC, Rocket League and more. 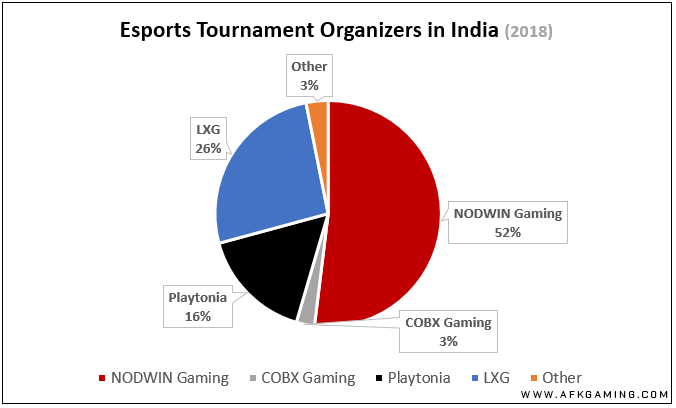 If prize pools are used as a barometer to determine market share, NODWIN Gaming continues to remain the market leader with 52% of all Indian esports prize pools in 2018 being attributed to tournaments conducted by or in association with them. This is a marginal dip from their share in the previous year which stood at 53.37%. The remaining half of the market has undergone a tectonic shift. The second largest player of 2017 (U Cypher) played host to no tournaments this year* while Playtonia and LXG have since increased their market share to 16% and 26% respectively. *U Cypher aired in 2018 however the tournament itself was concluded towards the end of 2017. As such, all amounts for U Cypher were included in the 2017 edition of this article and were excluded from 2018 to avoid double counting. The maximum possible winnings for a Dota 2 team in 2018 was INR 49.5 Lakh / USD 70.7K. 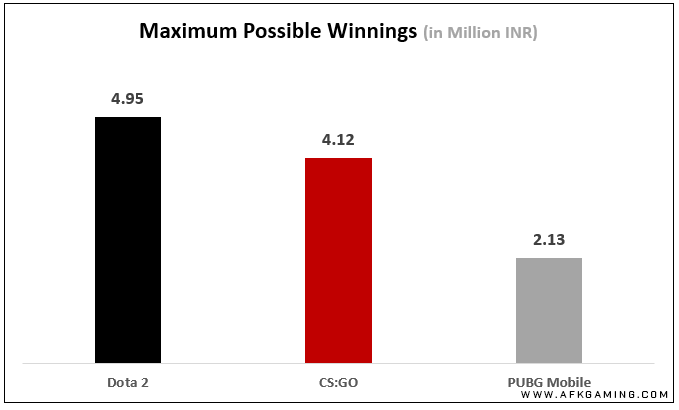 CS:GO players in India could win upto INR 41 Lakh / USD 58.9K while PUBG Mobile players could win upto INR 21.2 Lakh / USD 30.3K by placing first in every tournament that took place in 2018. Assuming an approximate 50% deduction for taxes and the team’s cut, by winning every single Dota 2 tournament in the country, an individual player in a 6 member team could have made an average amount of INR 34K per month. The same calculation when applied to CS:GO and PUBG Mobile approximates to INR 28K and INR 14K per player per month. As prize pools and overall interest for esports in India continue to burgeon, it’s only logical that international players and teams begin to consider tapping opportunities in the region. One of the first organizations to make this move were OpTic Gaming, who picked up an India based CS:GO roster. The OpTic India project has since shut its doors following the forsaken saga coupled with OpTic Gaming’s global restructuring. However, this hasn’t halted the flow of international players to India as is evidenced by Entity Gaming’s acquisition of European players followed by Signify absorbing the former captain of OpTic India – Lukas ‘yb’ Gröning. Meanwhile, Signify Dota continues to dominate everything in their path on the Indian circuit, while making progress at international LANs such as the PvP Esports Championship. Elsewhere, Indian Hearthstone player Tirth ‘gcttirth’ Mehta won a bronze medal at the Asian Games while local Tekken player Abhinav Tejan placed fourth at the 10th World Esports Championship 2018. Another name that’s begun making waves on the international circuit is Global Esports – an India based organization that sports teams in Korea, Singapore and India across Overwatch, Fortnite, Rainbow Six Siege and more. One of their Overwatch squads (Pantheon KR) fields globally renowned players such as Kephrii and is due to compete at the Overwatch Contenders 2018 Season 3: Pacific. 2018 was filled with exciting new developments. International teams competed on Indian soil, Indian pro gamers competed at international LANs and local tournament organizers began to explore the sale of media rights as a revenue source. However, explosive growth tends to attract its fair share of problems as organizations struggle to keep pace. On occasion, plans were made and announced but not executed. Other ambitious plans were actually executed but failed to deliver an optimal experience. Author’s Note: The objective of this section is not to provide ammunition for a witch hunt but rather to provide the reader with data to evaluate whether or not the hype and announcements made in 2018 have lived up to expections.. All the organizations listed below have in some capacity contributed to the growth of esports in India. For reasons unkown to us, some have either delayed, altered or failed to deliver on certain promises. In February 2017 Nazara Games – known primarily for their popular mobile games, announced that they were going to invest USD 20 million in Indian esports. The announcement mentioned that a special focus would be given toward developing players and talent from a grassroots level including tying up with universities to offer specialized courses however no further information about these plans have been made yet. In January 2018, Nazara Games acquired a 54.99% stake in NODWIN Gaming. The value of this transaction as per Nazara’s DRHP filed with SEBI is pegged at INR 41.2 Cr / USD 5.9 Mn. Additionally, the DRHP mentions a preferential allotment of shares to Turtle Entertainment GmBH (ESL's parent company) valued at INR 26 Cr / USD 3.7 Mn. Assuming no other investments were made towards esports in India, and that their initially announced plan for Indian esports has not materially changed, this still leaves a good USD 10.4 Mn left to be spent by Nazara Games over the next three years as per their announcement. The arrival of a prestigious international esports events on Indian shores was lauded as a defining moment in Indian esports. DreamHack Mumbai 2018 was arguably the largest LAN event to take place in the country in 2018 featuring a INR 1 Crore prize pool with a wide variety of games, competitions and activities for attendees and participants alike. The venue set up was well done and a star-studded line up of international teams and personalities was in attendance. However, the event suffered from multiple issues, which many could argue left attendees feeling like they paid for a less than optimal DreamHack experience. The root cause of the issues were internet outages which resulted in delays and a sub-par viewing experience for those watching at home. That said, the event did eventually conclude on time despite the delays and complaints but its sure to have left a feeling of dissatisfaction among the community and participants. Read more about the DreamHack India issues here. In March 2017, COBX Gaming announced that they were planning to invest USD 10 million into Indian esports. In a quote given to economic times, the company’s co-founder stated that they intended to host a $300,000 international league in December featuring teams from 16 different countries. No such league took place in December 2017 but since then, the COBX Masters – a two phase CS:GO and Dota 2 tournament was announced. Phase 1 took place in 2018 with a prize pool of approximately USD 14,000. Phase 2 was announced towards the end of 2018 with a prize pool of $200,000 due to take place in March 2019. Additionally, in April, COBX Gaming announced a tie up with PGL for their international events. In February 2018, Neon Gaming Studios, one of the companies behind the fairly successful Indian Esports Championship 2016, posted a video teasing an esports tournament with a prizepool of INR 50 lakh / USD 71k. The tournament was christened ‘NGS Championship 2018’. In 2018, Neon Gaming Studios has conducted various community events and tournaments however no additional information was posted about the NGS Championship. In February 2017, Riot Games had reportedly set up operations in India. During January this year, the Riot Games website listed an office in New Delhi with 10 open positions for brand managers, social media specialists, infrastructure managers and more. No new developments have come via Riot Games regarding their plans for the country and in February 2018, the then country manager (India) – Anurag Khurana parted ways with Riot India. At the time of writing this, the official Riot Games website lists zero open positions at the New Delhi office which leads us to believe that they have either shut their operations in India or have already filled all previously available positions. Season 1 of Ronnie Screwvala’s esports endeavour U Cypher aired in early 2018 and received mixed reactions from the community. Conversations about the next season hinted towards open qualifiers for participants and a reworked format. In September 2018, U Cypher posted a tweet asking for talent to apply for their upcoming events. Other than this however, no official announcements regarding the dates, format or even the existence of season 2 have been made. DreamHack was just the first of many such events to take place in the country. In addition to the COBX Masters phase 2 being due to take place in March 2019, it is now a widely known fact that Reliance JIO has entered the space as well. It’ll be interesting to see whether they choose to participate in the industry solely as tournament organizers or if they will take a more holistic approach. Meanwhile, the overall playerbase for esports titles in the country is being further fuelled by casual gaming platforms such as Gamingmonk. Tournament organizers are increasingly outsourcing league ops and content creation and marketing activities to companies like SoStronk and AFK Gaming while prioritizing sales, live production and general event management functions internally. The Indian gaming and esports ecosystem has long since taken root. The media rights war has just begun heating up in the country with Hotstar and Voot acquiring broadcast rights for Indian esports tournaments and localized broadcasts of international tournaments. With a variety of revenue sources for tournament IPs having been put through a trial run, the focus for 2019 will be establishing India as a destination for premium esports tournaments. Disclosure: This write up is not meant to be an unbiased research report. Views and opinions contained in this write up may not necessarily be shared by AFK Gaming. AFK Gaming has worked closely in official and unofficial capacities with most of the organizations mentioned within this write up. NODWIN Gaming and SMAAASH Innovations are investors in AFK Gaming. AFK Gaming was the official editorial partner for DreamHack Mumbai 2018.